In some years our birds have left by the end of August joining the smaller summer migrants on the travel routes back to the warmth of the South. However, this year, although KL left a couple of weeks ago, Bega and Unring are hanging on here. Pike and trout are in plentiful supply and Unring pulls them out of the Lake like a magician pulling rabbits out of hats. Bega – his beautiful assistant – then eats them. There seems little incentive for her to develop any digital dexterity to tickle trout, when Dad will do all the work. Her efforts at hunting consist of sitting on a post in the water and occasionally jumping in with a splash after the ripples. Her satellite tracker confirms that she is not fishing secretly at the other end of the Lake after we have gone home. All this has made for near guaranteed sightings of the birds over the past weeks from the telescopes at the Dodd Viewpoints, and even a chance of seeing Bega on the CCTV screens at Whinlatter on the nest toying with the latest meal. However, ready or not, the human side of the osprey season has to have an end and this is always at the end of August. So, tomorrow, Monday Bank Holiday will be the last time the 2 sites are manned this year. Not to give up entirely though. 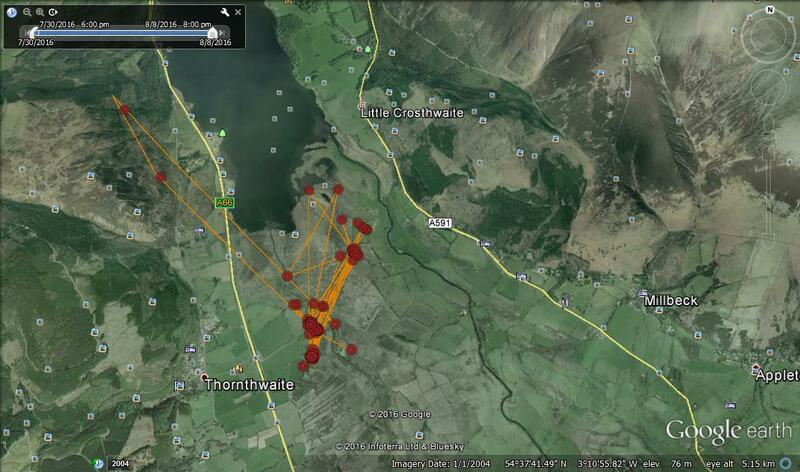 We hope to be continuing with this diary over the coming weeks as we have not one but two birds with trackers on. Currently, Number 14 our marathon 2013 bird is still flying around South Lakes but like Bega the urge to move South may kick in at any time. Unlike Bega he is now an expert fisherman and experienced traveller. We are crossing our fingers that both will survive the journey. Bega, big and beautiful, but still only 3 months old when all is said and done. She continues to fly over and around the Lake, often following Unring. However, like many young princesses she does not seem so inclined to do things for herself when Dad is there to do it for her! If he catches a fish she makes sure that she is positioned near to the nest, ready for him to pass it to her. Unring has been trying to entice her off by flying overhead with tasty trout and not giving instant delivery – to tempt her to go and fish for herself. But like many Dads, his willpower is weaker than hers and the fish always lands up on the nest, just where she wants it. Even princesses have their annoyances though! Although this looks like Bega is avoiding the water we know she has been flying and fishing over the Lake – it’s just that the signals have coincided with her time on land. The orange lines merely join the dots up and don’t represent her actual flight pattern. Interestingly it does show that she seems to have explored the first nesting site on the west side of the Lake where it all started in 2001. 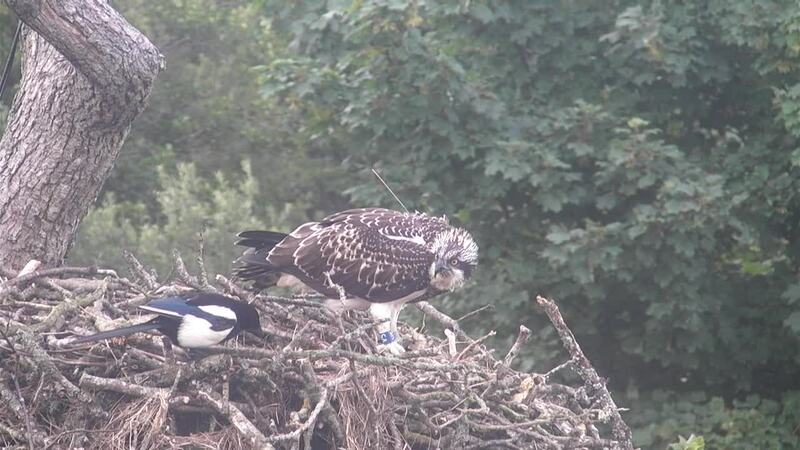 The current nest site is also being used still with Dad regularly bringing fish back for her to eat. There has been no sign of KL for a few days now so we must assume that she has started her long journey back to Africa leaving Dad to hold the baby. A kestrel hovering on the wind. A fish by strong talons pinned. A crackle from a gorse seed gun. A rowan ripening in the sun. Walk this bright land of light and shadows. Cumbria’s catching my heart, this year. 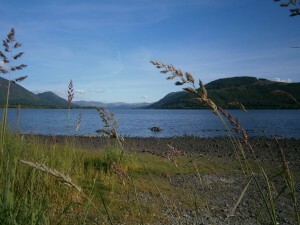 Dodd Viewpoint is the place to be! Since fledging on July 12th Bega has been a model example of a developing juvenile bird. The first few days were spent landing and taking off from the nest. Then by the end of the week she was extending her range to the Derwent river and the ‘diamond’ field, accompanied by her parents. 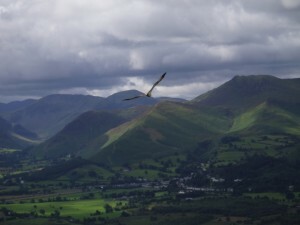 Viewing from Dodd Viewpoints has become better and better as the birds fly and fish closer and closer to the telescopes. In the past few days the next stage of Bega’s training for independence has begun and she has been spotted flying over the Lake, her instincts for hunting fish being woken as she stares down into the water. If you want an even more immersive experience spotting ospreys try swimming in the silk blue waters of the North after the Viewpoint telescopes are put away at 17.00. Seeing the iconic pale belly and angled wings set against the sky, as unafraid, one of our birds quarters the water, is a sight for life.